The Harbor Ring advocates for a 50-mile recreational route around the New York Harbor that unites Staten Island, Brooklyn, and Manhattan in New York with Hoboken, Jersey City, and Bayonne in New Jersey, including a bicycle and pedestrian pathway over the Verrazano-Narrows Bridge. The Harbor Ring currently integrates more than 28 miles of existing shared use paths and bikeways, including significant portions of the Brooklyn Waterfront Greenway, the East Coast Greenway, the Hudson River Walkway, the Hudson River Greenway, and the East River Esplanade. 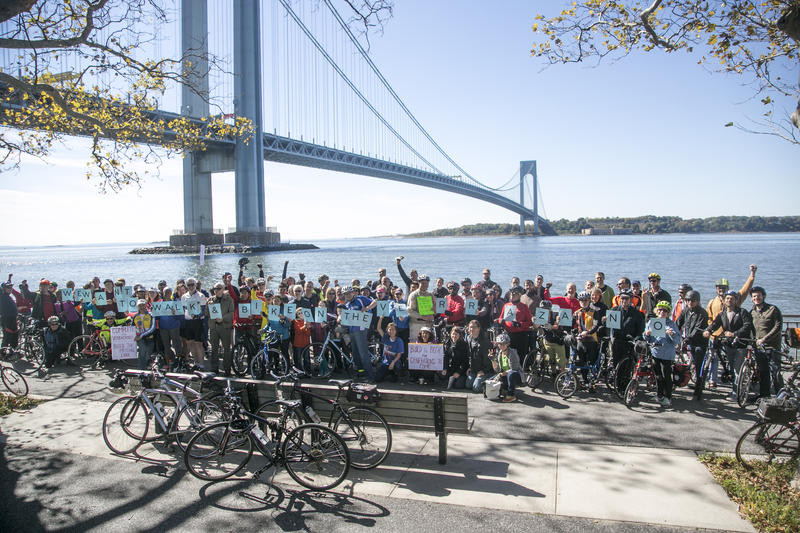 While the balance of the route is complete and ready for people to enjoy, many sections are missing dedicated bicycle and pedestrian infrastructure, most notably the Verrazano-Narrows Bridge. When complete, the Harbor Ring will generate tourism and foster economic activity, offer unprecedented recreational and active-living opportunities, increase commuting options for thousands of New York and New Jersey residents, and continue to establish the region as one of the nation’s most bike-friendly. Please support the Transportation Alternatives Harbor Ring Campaign by signing our petition!